Jannedy, Stefanie, Caterina Petrone, Jack Tomlinson & Marzena Żygis (in preparation). Intonation contours of incredulity in German. Quiroz, Sergio, Marzena, Żygis & Fatima Hamlaoui (in preparation). Calling contours in German, French and Baasa. Żygis, Marzena, Fuchs Susanne, Caterina Petrone & Jack Tomlinson (in preparation). Perception of parenthetical constructions in German. Żygis, Marzena, Zofia Malisz, Marek Jaskula & Ireneusz Koider (submitted). The involvement of the cerebellum in speech and non-speech motor timinig tasks. A behavioural study of patients with cerebellar dysfunctions. Żygis, Marzena, Štefan, Beňuš & Bistra Andreeva (submitted). Intonation: Other pragmatic functions and phonetic/phonological effects. Oxford Guides to World's Languages. Slavonic Languages. Żygis, Marzena & Susanne Fuchs (to appear). How prosody, speech mode and speaker's visibiity influence lip aperture. Proceedings of the 19th International Congress of Phonetic Sciences. Żygis, Marzena, Jaskula, Marek, Daniel, Pape & Laura Koenig (to appear). The dynamics of Polish sibilant production in the process of language acquistion. Proceedings of the 19th International Congress of Phonetic Sciences. Żygis, Marzena, Jana Brunner & Scott Moisik (under revision). Why do glottal stops trigger vowel lowering? Perceptual and articulatory evidence. Żygis, Marzena, Fatima Hamlaoui & Jonas Engelmann (submitted). Secondary stress in Polish and its realisation in focus position. Żygis, Marzena (accepted). Optimality Theory. Wörterbuch zur Sprach- und Kommunikationswissenschaft Phonetik/Phonologie. Żygis, Marzena (accepted). Dependency Phonology. Wörterbuch zur Sprach- und Kommunikationswissenschaft Phonetik/Phonologie. Żygis, Marzena (accepted) (i) Constraint. (ii) Constraint hierarchy. (iii) Constraint family, (iv) Constraint ranking (v) Identity constraints (vi) Markedness constraints. Wörterbuch zur Sprach- und Kommunikationswissenschaft Phonetik/Phonologie. Żygis, Marzena, Jaskula, Marek & Laura Koenig (2018). Do children understand better adults or themselves? A perceptual study of Polish /s, ʂ, ɕ/. Journal of the Acoustical Society of America 144, 1963. *Blaszczak, Joanna & Marzena Żygis (2018). Nicht perfekt, aber glücklich. Aus dem Sprachleben deutsch-polnischer Schüler in Berlin. In: Hufeisen, Britta, Rosenberg Peter, Schröder, Christoph, Sopata Aldona & Tomasz Wicherkiewicz (eds.) Sprachbildung und Sprachkontakt im deutsch-polnischen Kontext. Berlin: Peter Lang. 19-43. Kraska-Szlenk, Iwona, Żygis, Marzena & Marek Jaskula (2018). Acoustic study of ł-vocalisation in Polish. In: Czaplicki, Bartlomiej, Łukaszewicz Beata & Monika Opalinska (eds.). Phonology, Fieldwork and Generalizations. Berlin: Peter Lang. 239-257. *Żygis, Marzena, Fuchs, Susanne & Katarzyna Stoltmann (2017). Orofacial expressions in German questions and statements in voiced and whispered speech. Journal of Multimodal Communication Studies vol. 4, issue 1-2, 87-92. *Quiroz, Sergio & Marzena Zygis (2017). The vocative chant and beyond: German calling melodies under routine and urgent contexts. Proceedings of Interspeech 2017, 1208-1212. Stockholm, Sweden. *Żygis, Marzena & Zofia Malisz (eds.) (2016). 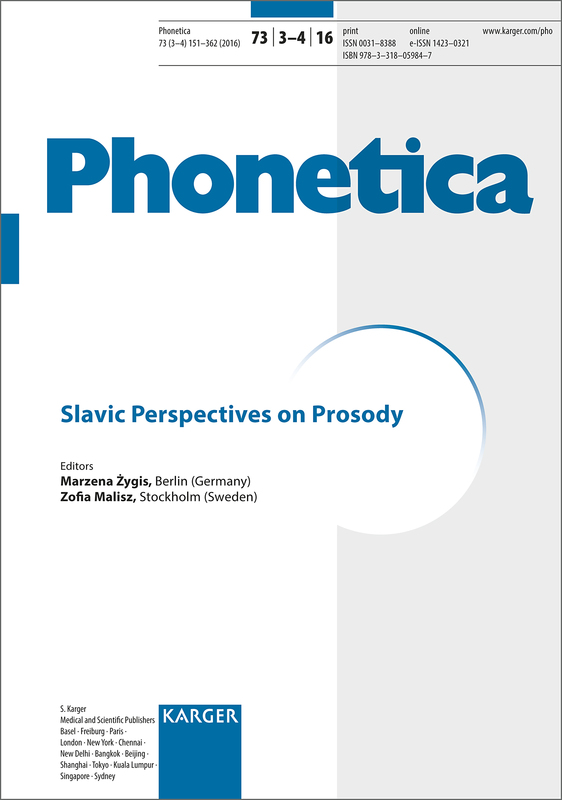 Slavic Perspectives on Prosody. Special Issue of Phonetica 73, vol. 3 (Slavic Prosody) & 4 (Interfaces in Slavic Prosody). Czaplicki Bartlomiej, Żygis, Marzena, Pape Daniel & Luis Jesus (2016). Analiza akustyczna i sociolingwistyczna nowych sybilantów w wymowie młodych Polek. Poradnik Jezykowy [The Linguisitc Guide] 7, 38-53. *Czaplicki Bartlomiej, Żygis, Marzena, Pape Daniel & Luis Jesus (2016). Acoustic evidence of new sibilants in the pronunciation of young Polish women. Poznań Studies in Contemporary Linguisitics 52, 1-42. Błaszczak, Joanna & Marzena Żygis (2014). Bin ich Deutscher oder Pole? 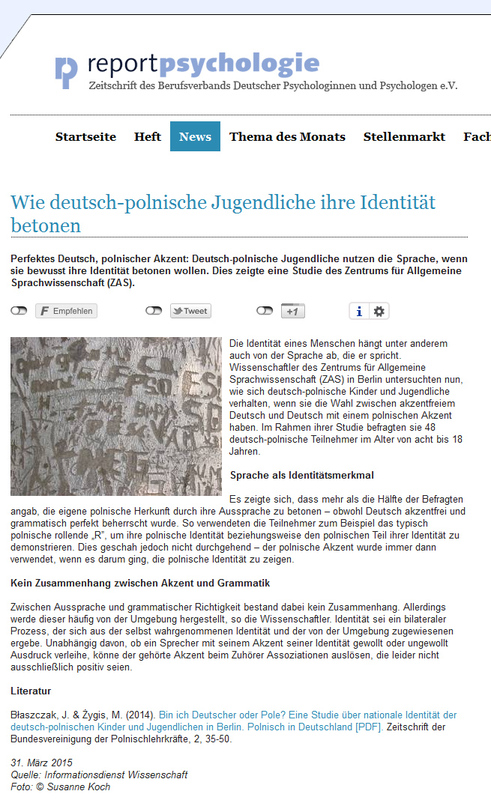 Eine Studie über nationale Identität der deutsch-polnischen Kinder und Jugendlichen in Berlin.Polnisch in Deutschland. Zeitschrift der Bundesvereinigung der Polnischlehrkräfte 2, 35-50. *Żygis, Marzena, Pape, Daniel, Luis M.T. Jesus & Marek Jaskula (2014). Intended intonation of statement and polar questions in Polish whispered, semi-whipered and normal speech modes. In: Campbell, Nick, Gibbon, Dafydd & Daniel Hirst (eds.). Proceedings of the 7th International Conference on Speech Prosody, Dublin. Irland. 678-682. *Ünal, Özlem, Fuchs, Susanne & Marzena Żygis (2014). Soft 'g' in Turkish: Evidence for Sound Change in Progress. In: Fuchs, Susanne, Grice, Martine, Hermes, Anne, Lancia, Leonardo & Doris Mücke (eds.). Proceedings of the 10th International Seminar on Speech Production, Cologne, Germany. 437-440. *Żygis, Marzena, Pape, Daniel, Luis M.T. Jesus & Marek Jaskula (2014). How do voiceless fricatives contribute to intended intonation? A comparison of whispered, semi-whispered and normal speech. In: Fuchs, Susanne, Grice, Martine, Hermes, Anne, Lancia, Leonardo & Doris Mücke (eds.). Proceedings of the 10th International Seminar on Speech Production, Cologne, Germany. 472-475. *Malisz Zofia, Żygis, Marzena & Bernd Pompino-Marschall (2013). Rhythmic structure effects on glottalisation: A study of different speech styles in Polish and German. In: Grice, Martine & Doris Mücke (eds.). Temporal Structure and Mechanisms of Timing. Special Issue of Laboratory Phonology 4, 119-158. *Żygis, Marzena, Daniel Pape & Luis Jesus (2012). (Non)retroflex Slavic affricates and their motivation. Evidence from Czech and Polish. Journal of the International Phonetic Association 42 (3), 42. 281-329. *Kraska-Szlenk, Iwona & Marzena Żygis (2012). Phonetic and lexical gradience in Polish prefixed words. Cognitive Linguistics, 23(2), 317-366. *Żygis, Marzena, Fuchs, Susanne & Laura König (2012). Phonetic explanations for the infrequency of voiced sibilant affricates across languages. Laboratory Phonology 3, 299-336. *Żygis, Marzena, Brunner, Jana & Scott Moisik (2012). The affinity of low vowels and glottal stops: an articulatory model and a perceptual investigation. Proceedings of the 13th Conference on Laboratory Phonology. 27-28. *Żygis, Marzena & Bernd Pompino-Marschall (2012). Glottale Markierungen vokalinitialer Wörter. Deutsch und Polnisch kontrastiv. In: Zifonun, Gisela & Lutz Gunkel (eds.) Deutsch im Sprachvergleich. Grammatische Kontraste und Konvergenzen. Berlin: de Gruyter. 75-98. *Pompino-Marschall, Bernd & Marzena Żygis (2011). Glottal marking of vowel-initial words in German. In: Lee, Wai-Sum & Eric Zee (eds.) Proceedings of the XVIIth International Congress of Phonetic Sciences, Hong Kong. 1626-1629. *Brunner Jana & Marzena Żygis (2011). Why do glottal stops and low vowels like each other? In: Lee, Wai-Sum & Eric Zee (eds.) Proceedings of the XVIIth International Congress of Phonetic Sciences, Hong Kong. 376-379. *Żygis, Marzena (2011). Why is Slavic /č/ not always /tʃ/? In: Lee, Wai-Sum & Eric Zee (eds.). Proceedings of the XVIIth International Congress of Phonetic Sciences, Hong Kong. 2340-2343. Żygis, Marzena (2010). On changes in Slavic sibilant systems and their perceptual motivation. In: Recasens, Daniel, Fernando Sánchez Miret & Kenneth J. Wireback (eds.). Experimental Phonetics and Sound Change. München: Lincom. 115-138. Pompino-Marschall, Bernd & Marzena Zygis (2010). Glottal marking of vowel-initial words in German. In: Weirich, Melanie & Stefanie Jannedy (eds.). Papers from the Linguistics Laboratory. ZASPiL 52, 1-17. Zygis, Marzena (2010). Typology of consonantal insertions. In: Weirich, Melanie & Stefanie Jannedy (eds.). Papers from the Linguistics Laboratory. ZASPiL 52, 111-140. *Zygis, Marzena & Jaye Padgett (2010). A perceptual study of Polish sibilants, and its implications for historical sound change. Journal of Phonetics 38.2, 207-226. *Fuchs, Susanne, Toda, Martine & Marzena Żygis (eds.). (2010). Turbulent Sounds. An Interdisciplinary Guide. Berlin: de Gruyter. *Hall, T. A. & Marzena Żygis (2010). An overview of the phonology of obstruents. In: Fuchs, Susanne, Toda, Martine & Marzena Żygis (eds.). Turbulent Sounds. An Interdisciplinary Guide. Berlin: de Gruyter. 1-37. Fuchs, Susanne, Toda, Martine & Marzena Żygis (2010). Preface. In: Fuchs, Susanne, Toda, Martine & Marzena Żygis (eds.). Turbulent Sounds. An Interdisciplinary Guide. Berlin: de Gruyter. v-ix. *Żygis, Marzena, Daniel Recasens & Aina Espinosa (2010). The role of position in testing the acoustic equivalence hypothesis of velar softening for aspirated stops. To appear in: Fuchs, Susanne, Mooshammer, Christine, Hoole, Phil & Marzena Żygis (eds.). Between the Regular and the Particular in Speech and Language. Frankfurt/M: Peter Lang Verlag. 125-143. *Fuchs, Susanne, Mooshammer, Christine, Hoole Phil & Marzena Żygis (eds.) (2010). Between the Regular and the Particular in Speech and Language. Frankfurt/M: Peter Lang Verlag. *Żygis, Marzena & Susanne Fuchs (2008). Why are voiced affricates avoided cross-linguistically? Evidence from an aerodynamic study. Proceedings of the 8th International Speech Production Seminar: Institute de phonetique Strasbourg. 421-424. *Żygis, Marzena, Recasens, Daniel & Aina Espinosa (2008). Acoustic characteristics of velar stops and velar softening in German, Polish and Catalan. Proceedings of the 8th International Seminar on Speech Production, Strasbourg: Institute de phonetique Strasbourg, 97-100. Żygis, Marzena & Susanne Fuchs (2008) (eds.). Papers in Phonetics and Phonology. ZAS Papers in Linguistics 49. Żygis, M. (2008). On the avoidance of voiced sibilant affricates. ZAS Papers in Linguistics 49, 23-45. Żygis, M. (2007). O szczególnych cechach audytywnych wibrantów. Some remarks on auditive properties of trills. Logopedia 27, 43-49. *Padgett, Jaye & Marzena Żygis (2007). The Evolution of Sibilants in Polish and Russian. In: Cavar, Malgorzata & T.A. Hall (eds.) Special volume on Slavic Phonology. Journal of Slavic Linguistics 15.2, 291-324. *Cetnarowska, Bozena and Marzena Żygis (2007). Phonetic syllabification and morphological parsability: the case of prefixed words in Polish. In: Arabski, Janusz (ed.) (2007) Challenging tasks for Psycholinguistics in the new century. Katowice: Uniwersytet Slaski, 149-163. Fuchs, Susanne, Żygis, Marzena, Brunner, Jana, Busler, Anke, Velkov, Hristo & Pascal Perrier (2006): Temporal and spacial aspects in the realisation of voiced and voiceless sibilants in different word positions. Stem-, Spraak- en Taalpathologie 14: 19. *Hall, T.A., Hamann, Silke & Marzena Żygis (2006). The phonetic motivation for phonological stop assibilation. Journal of the International Phonetic Association 36, 59-81. Żygis, Marzena (2005). Non(retroflexivity) of Slavic affricates and its motivation. The case of Polish and Czech. ZAS Papers in Linguistics 42, 69-115. Żygis, Marzena (2005). (Un)markedness of trills: the case of Slavic r-palatalisation. Zeitschrift für Slawistik 50, 383-407. Silke Hamann and Marzena Żygis (2005). Phonology. In: Ammon, Ulrich, Dittmar, Norbert & Klaus. J. Mattheier (eds) Sociolinguistics : an International Handbook of the Science of Language and Society. Berlin: Walter de Gruyter. 512-521. Żygis, Marzena (2004). Dlaczego polskie sybilanty i są retrofleksami? Logopedia 33, 119-131. Hall, T.A., Hamann, Silke & Marzena Żygis (2004). The phonetic motivation for phonological stop assibilation. In: Hamann, Silke & Susanne Fuchs (eds.). Papers on Phonetics and Phonology. ZAS Papers in Linguistics 37: 187-219. Żygis, Marzena (2004). (Un)markedness of trills: the case of Slavic r-palatalisation. In: Hamann, Silke & Susanne Fuchs (eds.) Papers on Phonetics and Phonology. ZAS Papers in Linguistics 37, 137-166. Cetnarowska, Bozena and Marzena Żygis (2004). Syllabification across a prefix-stem boundary in Polish. The role of semantic compositionality. 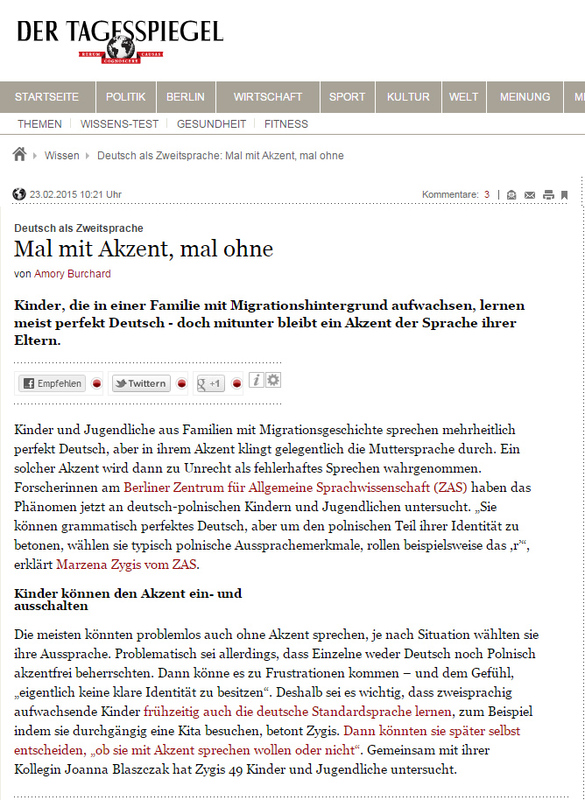 Zeitschrift für Slawistik 49, 42-60. Padgett, Jaye and Marzena Żygis (2003). The Evolution of Sibilants in Polish and Russian. In: Hall, T.A. and Silke Hamann (eds). ZAS Papers in Linguistics 32: 155-174. ROA 686-0904. Żygis, Marzena (2003). Phonetic and Phonological Aspects of Slavic Sibilant Fricatives. In Hall, T.A. and Silke Hamann (eds). ZAS Papers in Linguistics 32: 175-213. Kosta, Peter, Błaszczak, Joanna, Frasek, Jens, Geist, Ljudmila & Marzena Żygis (2003) (eds.). Investigations into Formal Slavic Linguistics. Berlin: Peter Lang Verlag. Żygis, Marzena (2003). The Role of Perception in Slavic Sibilant Systems. In: Kosta, Peter, Błaszczak, Joanna, Frasek, Jens, Geist, Ljudmila & Marzena Żygis (eds.). Investigations into Formal Slavic Linguistics. Berlin: Peter Lang Verlag. 137-154. *Żygis, Marzena and Silke Hamann (2003). Perceptual and acoustic cues of Polish coronal fricatives. Proceedings of the 15th International Congress of Phonetic Sciences, Barcelona 3-9 August. 395-398. *Pompino-Marschall, Bernd and Marzena Żygis (2003): Surface Palatalization of Polish Bilabial Stops: Articulation and Acoustics. Proceedings of the 15th International Congress of Phonetic Sciences, Barcelona 3-9 August. 1751-1754. *Rochoń, Marzena (2003). Is syllabification a diagnostic for prosodic words? Evidence from Polish. In: Maienborn, Claudia (ed.) (A)symmetrien-(A)Symmetries. Tübingen: Stauffenburg Verlag. 297-320. Hall, T. A. and Marzena Rochoń (2002). ‘Preface’ In: Hall, T. A., Pompino-Marschall, Bernd & Marzena Rochoń (eds.) Papers on Phonetics and Phonology: The Articulation, Acoustics and Perception of Consonants. ZAS Papers in Linguistics 28: i-ii. Hall, T.A., Pompino-Marschall, Bernd & Marzena Rochoń (eds) (2002). Papers on phonetics and phonology: the articulation, acoustics and perception of Consonants. ZAS Papers in Linguistics 28. Rochoń, Marzena (2002). Recenzja. Szpyra, J. (2002). Wprowadzenie do współczesnej fonologii. Logopedia 30, 233-237. Rochoń, Marzena (2002). The Role of the Phonological Word in Slavic Languages: Voicing Phenomena. In: Blankenborn, Renate, Dönninghaus Sabine and Robert Marzari (eds.). Beiträge der Europäischen Slavistischen Linguistik (POLYSLAV) 5. München: Otto Sagner Verlag. 183-192. Rochoń, Marzena (2001b). Syllabification in Polish: an OT account. In: Zybatow, Gerhild, Junghanns, Uwe, Mehlhorn, Grit & Luka Szucsich (Hgg.). Aktuelle Beiträge zur formalen Slavistik. Frankfurt/Main: Peter Lang. 3-14. Rochoń, Marzena (2001a). How does stress influence syllable structure?.’ In: Böttger, Katharina, Dönnighaus, Sabine & Robert Marzari (ed.) 2001. Beiträge der Europäischen Slavistischen Linguistik (POLYSLAV) 4. München, 210-219. Hall, T. A. and Marzena Rochoń (2000) (ed.). Investigations in prosodic phonology: the role of foot and prosodic word. ZAS Papers in Linguistics 19. Rochoń, Marzena (2000b). Prosodic constituents in the representation of consonantal sequences in Polish. ZAS Papers in Linguistics 19, 2000: 177-205. Rochoń, Marzena (2000a). Optimality in Complexity: The Case of Polish Consonant Clusteras. Berlin: Akademie Verlag. Rochoń, Marzena & Bernd Pompino-Marschall (1999). The articulation of secondarily palatalized coronals in Polish. Proceedings of XIVth International Congress of Phonetic Sciences, San Francisco. 1897-1900. Rochoń, Marzena (1999b). An OT approach to coronal palatalization. In: Böttger, Katharina, Giger, Markus & Björn Wiemer (Hrsg.). Die Welt der Slaven. Beiträge der Europäischen Slavistischen Linguistik (POLYSLAV). Band 2, 244-253. München: Otto Sagner Verlag. *Rochoń, Marzena (1999a). Application of Universal Constraints in Polish: Palatalized Labials. Lingustica Silesiana 20, 31-59. Błaszczak, Joanna und Marzena Rochoń (1999): Some Remarks on Minimality and Optimality, not only in Language. Kwartalnik Neofilologiczny XLV 3/98, 255-273.